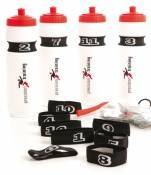 A great idea for a set of team bottles. Non-slip. Will fit any standard water bottle. Numbered 1-17. (Bottles not included).